Son of Rennie and Mary Elizabeth Leaver, of Gunnislake, Cornwall; husband of Gladys May Leaver, of Yeadon, Yorkshire. The wedding was solemnised on Tuesday at St. Augustine’s Church, Sheffield, of Sergeant-Observer N. Leaver, R.A.F. Coastal Command, the son of Mr. and Mrs. R. Leaver of Haggate, and Ambulance Driver Gladys May Bower, daughter of Mr. and Mrs. J. Bower, of 17, Endcliffe avenue, Sheffield. The bridegroom, who is an old boy of Ermysted’s Grammar School, Skipton, is an officer in the Sheffield office of H.M. Customs and Excise in civil life. He was formerly well known in the North-East Lancashire district and the West Riding of Yorkshire as a vocalist both as a soprano and afterwards as a boy baritone. The happy couple are spending their honeymoon motoring in the Yorkshire Dales. They will reside for the present at Glenalmond-road, Sheffield. 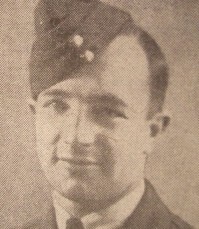 News has been received by Mr. and Mrs. Leaver, 231?, Burnley road, Haggate, that their son, Sergeant Observer N. Leaver, previously reported missing during operational flights over the Mediterranean, is now presumed “killed in action”, death being presumed to have taken place on December 11th, last. Attached to the Coastal Command of the R.A.F., Sergt. Leaver was a native of Haggate, but had resided in Sheffield with his parents until the “blitz” in December, 1940. Educated at Ermysted’s Grammar School, Skipton, where he had a very successful career, Sergt. Leaver was known throughout the Craven area, where he made a name for himself as a baritone singer and took principal parts in several operatic performances. As a boy he attended Briercliffe’s Council School and for years was a member of Briercliffe St. James’s Church choir and was soprano soloist until he removed to the Craven district. Upon leaving school he was appointed to the Customs and Excise Office, Sheffield, and was an officer there at the time of his enlistment soon after the declaration of war. In the R.A.F. he had several very successful flights against the enemy, and was offered a commission, which he declined. An all-round sportsman, he played both cricket and Rugger with the R.A.F., but his chief hobbies were photography and motor cycling, and at times he had visited most parts of the country in pursuit of his pastime. Much sympathy will be extended to his wife, who is an officer in the ambulance section of Civil Defence at Sheffield, and to his parents, in their great loss. 1943 – LEAVER Nevil of 33 Glenalmond-road, Sheffield, died on or since 11 December 1941 on war service. Administration, Wakefield, 29 January to Gladys May Leaver, widow. Effects £297 6s. 7d.